Thank you for tuning in for the latest updates on Woodward Lofts. Things have been moving and shaking over here @LoftsStl. You may have noticed some exciting improvements such as our “Now Leasing” fence banners or the dust of the old making way for the new. As a new roof is layed outside in the summer sun, dry wall is being hung throughout each of our units. The most exciting construction preview to reveal itself this week are the first windows to our luxury 2 story courtyard apartments. 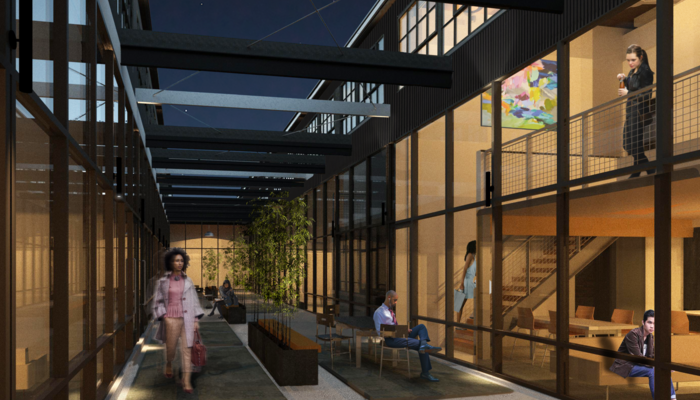 Our 2 story lofts feature a solid glass “fourth wall,” that overlooks an open air semi-private courtyard. These modern units are the largest of our one and two bedroom floor plans. True multi-level living and an extensive amount of natural sunlight are just two features that set these units apart from the masses. On the first level, you'll find an open kitchen complete with an island for extra storage and prep-space, not to mention the brand new, stainless steel, state-of-the-art appliances that come standard in each unit. In the living room you will notice sky high windows expanding 18 feet from floor to ceiling. Your open air staircase guides you to your master suite complete with a large full bath, a walk in closet and second level laundry. These multi level lofts come in multiple floor plans including 1 bed x 1 bath, 1 bed x 1.5 bath, and 2 bed x 2 bath. Looking to host our first residents winter 2018, we are currently in the process of leasing our first units. We would love to assist your discovery of the luxury loft suited for your lifestyle. Be sure to check back weekly for more updates. Did you See the Signs? The fences banners have been hung the hours have been posted. Have you contacted the leasing annex yet to discuss your personalized hard hat tour? Can’t wait to tour? Stop by the leasing annex to get a sneak peek of your future home including a personalized consultation to customize the finishes and floor plan in your new loft. This is a perfect way to get a taste of Woodward! Have you been following us online? Do you know where you will see us next? Keep your eyes peeled for Woodward Waldo! Find Waldo and #Win! Be bare or be square… we will see you there!